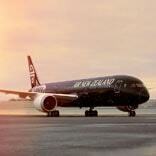 Our 787-9 Dreamliner flying direct to Auckland connecting you to North and South America. Air New Zealand will operate a combination of Boeing 787-9 Dreamliner and Airbus A320 aircraft between Auckland and Adelaide over the peak season. Sale ends 11.59pm AEST 29 Apr 2019. Advertised fares are one way per person. Travel periods apply, see above for details. A non-refundable service fee of AUD30 per person, per one-way journey applies to Contact Centre bookings. Paying for your booking with a charge, credit or debit card incurs a percentage based fee that differs by card type. Return government and airport charges may vary. Seats are limited & will not be available on all flights or days. Fares are available until sale ends or until sold out. Baggage Allowances: For Economy Class, Seat+Bag and The Works airfares your first checked bag up to 23kg will be free, Works Deluxe passengers are entitled to two checked in bags up to 23kg each, Premium Economy passengers are entitled to two checked bags up to 23kg each and Business Class passengers are entitled to three checked bags up to 23kg each, with additional charges applying for additional bags. Passengers purchasing Seat Only fares are not entitled to a free checked baggage allowance, however bags can be pre-purchased prior to travel online via Manage Bookings or by phoning the contact centre (see rates and terms and conditions), or alternatively for a higher rate at the airport. Fares that are Smart Saver economy fares are not eligible to accrue Airpoints Dollars™. Customers who purchase fares using Airpoints Dollars will be required to pay in cash, the government & airport costs. Cancellation/change fees may apply. Price correct as at 23 Apr 2019. Prices may fluctuate due to exchange rate and tax movements. New deals may be released at any time. Airfares may be extended. Standard Air New Zealand Conditions of Carriage, fare rules and Website Terms & Conditions apply.